Question 1: Would any of you have knowledge of how to make a homemade Kemmerer type sampler for lowering off of bridges and the like? Question 2: We are looking to construct integrated water samplers for lakes, or if there are inexpensive commercially available integrated samplers. Question 3: Do any of you have good or bad experience with basket samplers? Suggestions for design of the samplers, or anything we should watch out for? How have your volunteers reacted to them? Question 4: Does anyone have good instructions for building a macroinvertebrate aquarium? Would any of you have knowledge of how to make a homemade Kemmerer type sampler for lowering off of bridges and the like? A request: Could anyone replying directly to Jan rather than the whole listserv please copy me on their message? With regard to skewing the DO measurement by using a bucket/ surface water sample, wouldn’t you aerate the sample as soon as you emptied the sampler into another container for DO measurement? Not knowing your DO measurement method (Clark cell, optical probe, Winkler titration), it is hard to say if the collection method would have an impact greater than the measuring method’s accuracy. You’d have to do a lot of splashing and sloshing to exceed the Clark cell accuracy of most meters (anywhere from 0.2 mg/L to 0.5 mg/L for the better cells). Don’t remember off the top of my head the Winkler accuracy and precision. What I do remember is that the quality of the reagents and lighting to see the color change is important to that method. If you have to have non-surface DO, then, yes, a collection bottle is needed. I just hope they rinse the bucket in stream water if they are also collecting nutrient chemistry samples. With regard to collecting a proper DO sample for titration. 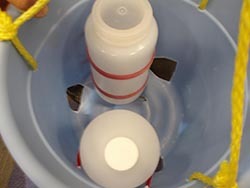 If you carefully deploy a bucket that is fitted with a spout and tubing that allows you to fill a BOD bottle (specially designed not to trap air bubbles when closed) from the bottom up- and you count how long it takes to fill the bottle up and allow for 2 to 3 full volumes of water to flush through you should have a reasonably uninfluenced/disturbed sample to work with. Just remember that this sample only represents the surface water conditions if you are dealing with a system that has any temperature, current, or density (do to dissolved solids/salts) stratifications. So it would be fine for a mixed system. Here is a relatively inexpensive unit available thru Ben Meadows. There are a few others on their website also. 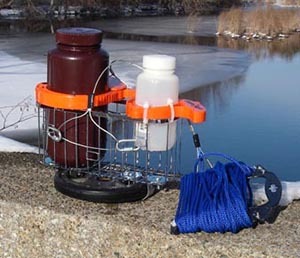 We are looking for plans/designs for constructing integrated water samplers for lakes. Or, if there are commercially available integrated samplers that are inexpensive, we would also be interested in that. Also, if you have used integrated samplers and have opinions on how well the instruments worked, I would appreciate that. the middle for easier transport and for sampling turbid water bodies. until the valve us just under the surface. Then close the valve and bring it on board your boat. the water falls out very quickly. If you have any questions, feel free to ask. I can even take a couple of snapshots if you’d like. attachment (and would be happy to share with others who are interested – Editor’s note, these are included below). Subject: [volmonitor] Experiences with basket samplers? Charles River Watershed Association has a seventy-person volunteer monthly river water quality monitoring program. 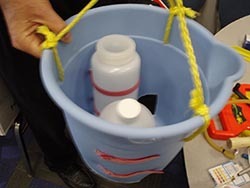 We currently use buckets to take samples (mostly off bridges), which are transferred into sample bottles. However, we are in process of switching over to basket samplers so that the water can be collected directly, without the potential for contamination from the bucket. We have some ideas about the design of these basket samplers, but are still determining exactly what they will look like and be made of – we will be constructing them ourselves. Do any of you have good or bad experience with basket samplers? Suggestions for design of the samplers, or anything we should watch out for? How have your volunteers reacted to them? Subject: Re: [volmonitor] Experiences with basket samplers? to bring his equipment to the conference and I attached some photos. Hope this helps. better and included on the CWT Website. online and advertised. Fortunately it was included in the SWAMP QA Advisor. Course has been kept quite. attached a photo of the sampler we are currently piloting. Does anyone have good instructions for building a macroinvertebrate aquarium? If so, please send them my way. One product I have seen in place that creates an aquarium environment for benthic macroinvertebrates are Mike Strohm’s Creeklab. He has some educational materials that go with the product as well. but I don’t think it says anything about keeping the water cold once you introduce the macros, so I wonder how long they’d last. Assuming they weren’t eating each other anyway. I’ve been playing around for the past few years with an circular table-top stream (technical term: re-entrant flume) using an angled airlift tube to drive the current. Basic design is a large clear acrylic ice bucket (straight-sided). The airlift tube is a section of flexible pvc tubing (to fit the curve of the outside wall), angle should be about 45deg., stick it onto the side of the tank with small suction cups. In the center of the tank silicone a 2L soda bottle – top cut off and small holes in the bottom and top to allow water to flow through. This is to channelize the flow and keep the velocity up also, velocity would drop to zero at the center anyway. In the warm weather you can place a 1L soda bottle filled with water and frozen in the center as “refrigeration” to keep the temp down. Add slimy rocks in the bottom of the tank. Illuminate with desktop halogen lamp. You’re good to go. Been able to keep a few mayflies to hatch. Also, in both tanks that I’ve set up, I’ve wound up with healthy populations of freshwater hydra. I think that I’ve got some photos at home that I can post tomorrow, as well as some video of inverts (mostly mayflies) , if anyone is interested. Just tried to send a set of images to the list but the message was rejected by the listserv because it contained attachments. For the time being I’ll have to send them directly to individuals, until I can find some web space. So far Karen Anderson and Chris Andersen have requested images — I’ll send those out right after this message.